Item descriptionForever Aloe Berry Nectar™ contains all of the goodness found in our Forever Aloe Vera Gel®, plus the added benefits of cranberry and apple. Besides their reputation as a cleanser for the urinary tract, cranberries provide a high content of vitamin C.
Hepatoprotective action: The natural ingredient in YAKRUT SUDHA chemically exhibit potent Hepatoprotective property against induced hepatoxicity. It restores the functional efficiency of the liver by protecting the hepatic parenchyma and promoting hepatocelluler regeneration. 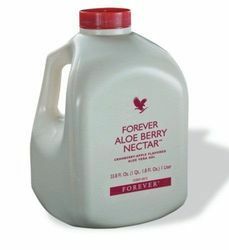 Forever aloe berry nectar - its good for kidney stone, urine infection, thyroid, gynecology problem, digestive problems, anti aging natural products..